Routers 802.11 ac is 3 times higher speed and wider range. I will talk about the benefits of the new standard wi-fi and how to transition to the new wireless technology. Broadcast video over a wireless network has always been a problem, had to wait for it to start video buffer, especially when the distance between the router and the client. Get real comfort when playing video in a wireless network will help new standard 802.11 ac. He has a high range of the network through the use of intelligent data transmission technologies. Plus, share files on a network, built on the basis of the standard 802.11 ac? 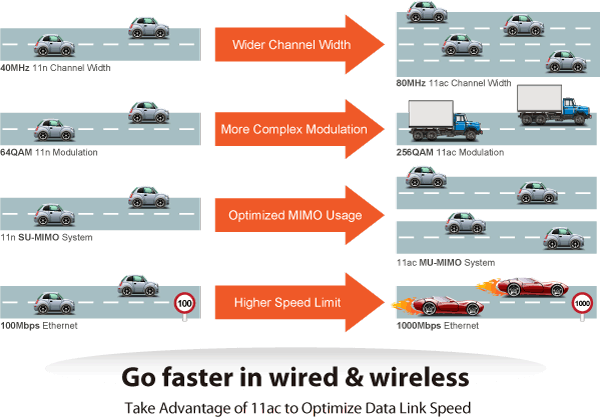 becomes effective, as are used for transmission wider channels that will yield a theoretical throughput of 1.3 Gb / s. In practice, the speed will be 500-600 Mbit / s, which is closer to the bandwidth gigabit wired network. You will be able to pass “on air” multiple HD-video streams without brakes. Most interesting is that high bandwidth saved with the obstacle of two walls. transfer large amounts of information in a single cycle (change modulation methods). Changing the frequency for many will not open as long in the sale were two-frequency routers. 5 GHz , which operates a wireless network 802.11 ac, possible to achieve high throughput, since this frequency range provides a more effective channel width. In addition, in comparison with the range of 2.4 gigahertz less loaded. It is used all wi-fi routers standard 802.11 n / g, as well as cordless phones, baby monitors and microwave ovens. Meanwhile sama on routers operating in the 2.4 GHz band is difficult to achieve the maximum possible throughput. Standard 802.11ac routers used almost entirely free the 5 GHz band. Truth to tell, devices operating in this range are more susceptible to the influence of walls and ceilings than the devices in the 2.4 GHz band, but in practice they operate effectively even in the presence of concrete barriers, due to its ability to emit a signal specifically to the client devices. Wireless LAN standard 802.11 ac works at 5 GHz, while the previous generation devices, typically use a frequency of 2.4 GHz. As you know, with each oscillation is transferred a certain amount of information – that’s why the 802.11 standard ac provides higher throughput. In the 2.4 GHz band for the wireless network is provided in the frequency band 80 MHz, while the 5 GHz range covers approximately 380 MHz. As a result, we have increased the number of channels of greater width, providing data transfer rate is much higher. 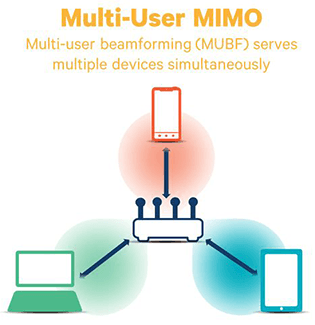 The standard 802.11 n data is transferred using MIMO technology (Multiple Input, Multiple Output) in a few streams, which increases throughput. In turn, routers 802.11 ac use technology MU-MIMO (Multiple User MIMO), which allows them to interact effectively with multiple devices. 5 GHz frequency band is 10 times larger than its predecessor 2.4 GHz. Wireless network standard 802.11 ac more channels available (fixed frequency) located at a specific distance from each other. The increased number of channels opens up opportunities to avoid interference. The new standard router optimized interaction with multiple client devices. 802.11 n standard equipment emits a signal equally in all directions for all available at the customer premises. As a result, the network device communicates with the router within a specified period of time, which limits the bandwidth. 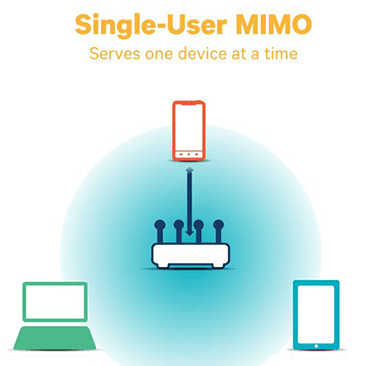 Through the above-described technology MU-MIMO (MultiUser MIMO) standard 802.11 ac router determines the position of the client in the network and specifically to a device transmits multiple data streams simultaneously. This is done Beamforming technology (formation of directional signal). The router, changing the signal components for each of its multidirectional antenna, amplifies the signal to the client side, and in the opposite weakens. The effect is applied constructive and destructive interference In this case, .Router 80211 standard ac 8 antennas can effectively interact with 4 different devices, each of which is equipped with 2 antennas. It should be noted that support for Beamforming available in standard 802.11 n, but because of the lack of generally accepted standards technology works only between the router and wi-fi adapters same manufacturer. The wireless network of a new standard has excellent bandwidth. For example, the data transfer rate between the two devices D-Link DIR-865L, configured as a router and client reached 553 Mbit / s. Believe me, this is enough for broadcasting 5 of Full HD video streams simultaneously. Just imagine, up to 1.5GB movie for 18 seconds. Routers operating in the 5 GHz band without problems transmit data over a distance of 10 m from one concrete and one Drywall, given in the form of foreign interference wireless networks. No one admits that the wave wireless networking standard 80211 ace is strongly influenced by the various obstacles in the path of the signal, rather than the 2.4 GHz band, but in practice Beamforming technology proves the opposite. Get at least ASUS RT-AC66U, which perfectly transmits the signal through walls at a speed of more than 350 Mbit / s.